T-Mobile and Sprint agreed to a merger earlier this year that would create a single, massive telecom company and would shrink the already-limited US marketplace for mobile carriers... and it looks like President Trump’s Department of Justice is just fine with that. The government’s top antitrust official hinted Friday that shrinking the market to just three major service providers likely won’t an issue. According to Reuters, the Justice Department’s antitrust division head Makan Delrahim was asked Friday if his agency would object to the merger on the grounds that it would mean one drop consumer options for mobile service providers from four to three. “I don’t think there’s any magical number that I’m smart enough to glean,” Delrahim replied. While his statement doesn’t fully commit the DOJ to taking a position one way or another on the T-Mobile-Sprint merger, it does represent a much more flexible position on the matter than the previous administration. Under President Obama, the DOJ drew a hard line on any merger that would drop the mobile market below four major providers. Using that position as a guideline, the DOJ blocked AT&T from purchasing T-Mobile in 2011, a decision that forced T-Mobile to become more competitive by offering plans consumers couldn’t get from AT&T or Verizon. The company killed off two-year contracts that locked in consumers, offered to pay off hundreds of dollars in termination fees to encourage people to switch carriers, made unlimited calls and texts standard, and reintroduced unlimited data plans. It didn’t take long for other carriers to make similar offers to prevent T-Mobile from stealing away customers. Per the FCC, four major mobile carriers—AT&T, Verizon, T-Mobile, and Sprint—account for 98 percent of the total wireless market in the US. Drop that down to just three companies, all in possession of basically equal portions of the pie, and the reason to compete essentially disappears. Canadians already suffer from this. The nation has three major carriers, all of which have similar subscriber numbers and little incentive to undermine one another. As a result, the country is home to some of the priciest phone bills in the world. 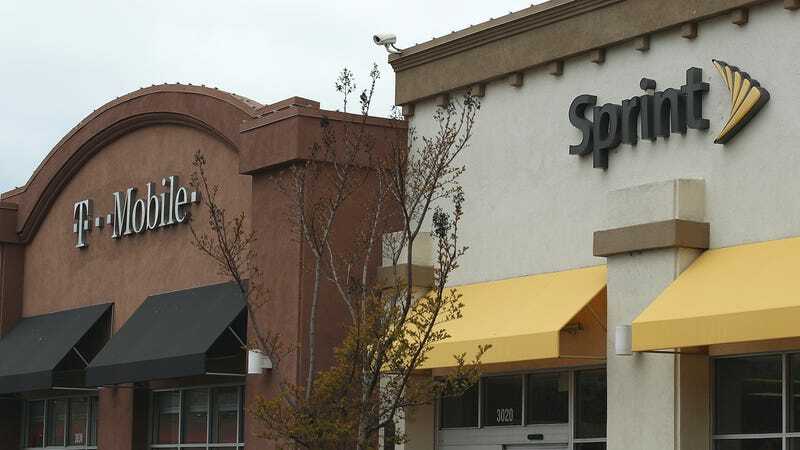 Even with Trump’s DOJ tipping its hand slightly and suggesting there is no problem with dropping to just three major carriers, some—including T-Mobile and Sprint’s competitors—expect there will be at least some challenge to the merger of the two firms. Earlier this week while speaking at Recode’s Code Conference, AT&T CEO Randall Stephenson said T-Mobile and Sprint will have “tough hill to climb” to complete the merger. “It’s a classic horizontal merger where you’re taking a competitor out of the marketplace,” the telecom head said, though he chose not to share his position on the merger. Executives at AT&T have previously said the company won’t contest the merger, and Verizon’s CEO Lowell McAdam has gone on record multiple times to say some variation of “We don’t care” regarding T-Mobile and Sprint. It looks like American consumers are going to have to get ready for the big four to drop to the big three.